This giveaway is the Unlimited Full Version available, not one year free trial. 3.Active full version Ashampoo® ZIP Pro with license key you received. 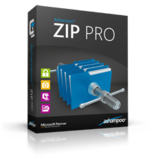 Enjoy Ashampoo® ZIP Pro free full version.